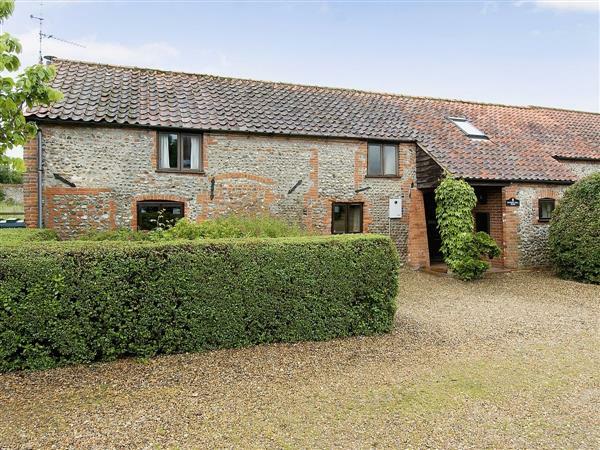 Bunker Hill Barn in Binham, Norfolk sleeps 6 people. A perfect holiday retreat, this comfortable and well furnished converted 17th-century barn features an attractive, spacious beamed interior and has a private, secluded south-facing garden. One of a pair, it is located in a peaceful no-through lane off the village green in the historic village of Binham, well known for its traditional butcher, general store and friendly pub. Just 3 miles from the coast, local attractions include sandy beaches and working fishing harbour at Wells (5 miles), Morston Saltmarsh Nature and Bird reserve, with sea trips to view seals (3 miles). The Georgian market town of Holt is 5 miles and the county capital of Norfolk with covered market, Norman castle and cathedral just 20 miles. Spacious beamed living room with cast iron wood-burning stove and French doors to garden. Well-equipped, farmhouse-style kitchen/dining-room with French doors to garden. Study. Cloakroom/W.C. First floor: Three partially beamed bedrooms; two doubles, both with views over garden, one with en-suite shower room/W.C., one twin-bedded. Bathroom/W.C. For a better idea of where Bunker Hill Barn is, you can see Bunker Hill Barn on the map below. Bunker Hill Barn is in Norfolk; should you be on the lookout for a special offer, you can find all the special offers in Norfolk. It's always worth checking to see what is on offer at the moment. Do you want to holiday near Bunker Hill Barn (CND), you can see other cottages within 25 miles of Bunker Hill Barn; have a look to find your perfect holiday location.